Over the years, I’ve spent a lot of time studying and chronicling the Micro-VC (or seed funds for those who prefer) In my post from last October titled “The Micro-VC surge won’t stop” I discussed the continued development of the Micro-VC space, and briefly mentioned the growth we’ve observed of what we deem as “Nano-funds”. · Seed stage focused venture funds that are <$15MM in size. · Typically started by managers with limited or no prior venture investing experience. · Serve as a “proof of concept” fund for the venture manager’s investment hypothesis, investing acumen, and ability to manage a venture firm. · Limited Partner bases that are either wholly or primarily made up of high net worth individuals and small family offices. · Often act as a co-investor versus a true lead/anchor investor. If a Nano-fund regularly serves a lead investor, it’s likely they are primarily investing in pre/early seed rounds. Over the past year, we’ve observed an increasing number of firms coming to market are starting with Nano-funds (in some cases, the initial fund target is higher than $15MM, but the fund ends with a final close that is south of that). To test whether that observation was simply anecdotal or not, I want to examine the Nano-fund trend a bit more comprehensively. First, let’s take a quick look at the # of new Micro-VC’s firms formed by year. Note this study only includes Fund I offerings, and thereby are all brand new firm formations. The numbers below are from data culled from Prequin, CB Insights, SEC Form D filings, and our own private tracking database. Now, let’s examine the % of new Micro-VC funds we’d put in the Nano-fund category by year. Again, only Fund I offerings were used in this dataset, and while some of the funds used in our dataset are still fundraising, we used what we know to be the current closed amount. We removed funds that we didn’t have current information on. 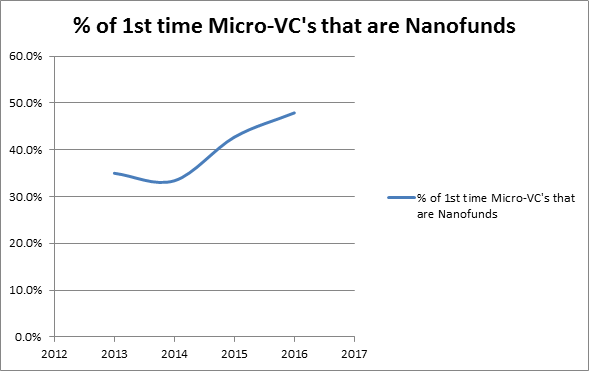 The chart above clearly illustrates the material growth in the number of Nano-Funds as a % of new Micro-VC firms every year (33.4% in 2014 to 47.9% in 2016). · Institutional Limited Partners that have significantly raised their bars for Fund I offerings, and have a general preference not to invest in first time managers. · The reliance on high net worth individuals and small family offices. The small check sizes associated with this group of LP’s forces many managers to settle for smaller funds. · The barriers of entry for new Micro-VC firms continue to drop, and even the most inexperienced investors can create Nano-funds. The Micro-VC community is fairly robust today, and with softer elbows than traditional venture firms, this enables much more collaboration and resource sharing. · The proliferation of technology across previously under served sectors, groups, and geographies, has spurred a growth sector/geographic/diversity focused Nano-funds. I’m very interested in tracking how the next few years unfold within Micro-VC. As I’ve mentioned in the past, I’m quite sanguine when it comes to the Micro-VC sector and the role institutional seed funding plays in global innovation. I also think the sentiment of too many Micro-VC firms being some sort of large systemic issue is incredibly apocryphal (Micro-VC’s made up less than 15% of total dollars raised by venture firms in 2016). I think 2017 will be very similar to 2016 in terms of overall Micro-VC growth. I also believe that it’s possible that we may see a small increase in the % of Micro-VC’s that are Nano-funds. 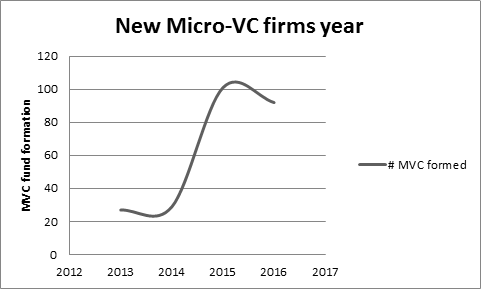 With all that said, I still believe a consolidation of the number of active Micro-VC firms (active defined as in writing checks for new investments) is both inevitable and not too far off. I now believe much of the consolidation will occur within the Nano-fund manager space, and it could happen as early as 2018/19 when many of the recent new entrants likely come back to market. One reason is that the absence of institutional Limited Partner backing (who traditionally have served as nearly automatic multi-fund investors) offers an extreme sensitivity to macro-economic factors. In down markets, individuals and family offices tend not to invest in high beta, illiquid asset classes. Ironically, a robust economic market could also adversely impact Nano-fund managers as a higher interest rate environment could compel investors to place their funds in moderately yielding liquid, lower beta asset categories. Of course, the goal for nearly all firms that start with Nano-funds is to scale fund size and to attract institutional LP backing starting with Fund II after some traction is proven out. In the past, this primarily meant getting a few good mark-ups in the portfolio. With the abundance of Micro-VC funds in market now, it’s doubtful that mark-ups alone will enable scale of most Nano-firms, and therefore many may be forced to either raise another Nano-fund (and hope the market is still oriented toward venture) or wind down their franchise due to career opportunity cost. It’s still a great time to start a venture firm, but perspective must be administered. The risks are certainly high. Fortunately, for those who make it, the rewards of running a successful venture franchise can be exponentially gratifying. One more departing (and hopefully inspirational) fact for those that are raising Nano-Funds — The combined capital raised by the first funds of Data Collective, Lowercase, and SoftTech would represent the size of a single Nano-Fund.